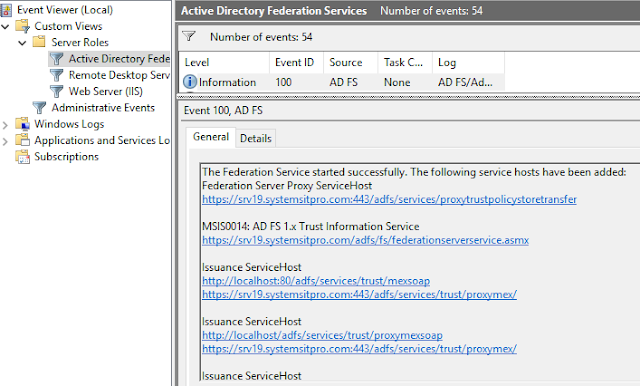 Active Directory Federation Services (AD FS) also popularly known as SAML/Federation Services/SSO. It provides Web single-sign-on (SSO) to authenticate a user to multiple Web applications while utilizing a single account which makes end users life much easier at the time to login to their HR cloud-based app etc. 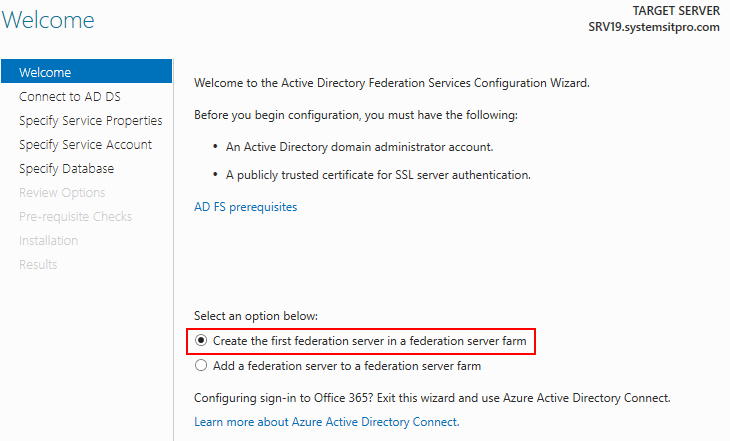 ADFS also facilitates Azure AD Connect deployment for Office 365 and Azure deployments and integration. This will be the setup on my lab, this might vary depending on your environment and needs. On the Installation Type page, Select Role-Based and Next. On the Server Selection page, Select ADFS Primary Farm Server and Next. On the Server Roles page, Select Active Directory Federation Services Role and Next. On the Features page, Next. On the ADFS overview page, Next. On the Results page Review and Close. 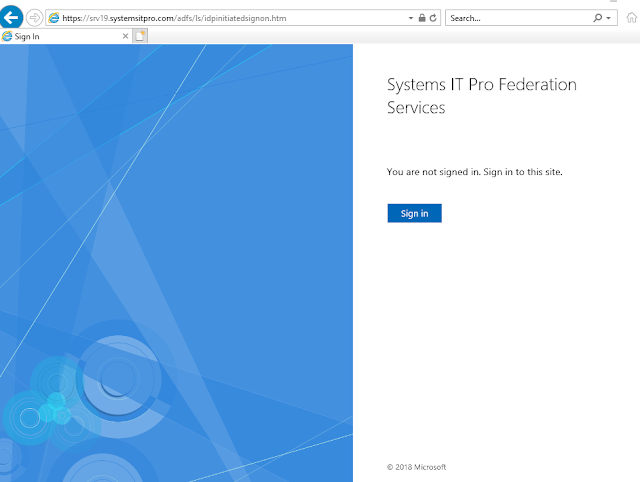 Open the Server Manager, navigate to the Flag Icon click and Select Post-Deployment Configuration for ADFS. On the Welcome page of the Configuration, wizard select Create the first federation server in a federation server farm and click Next. On the Connect to AD DS page, specify a Domain Admin account and Next. 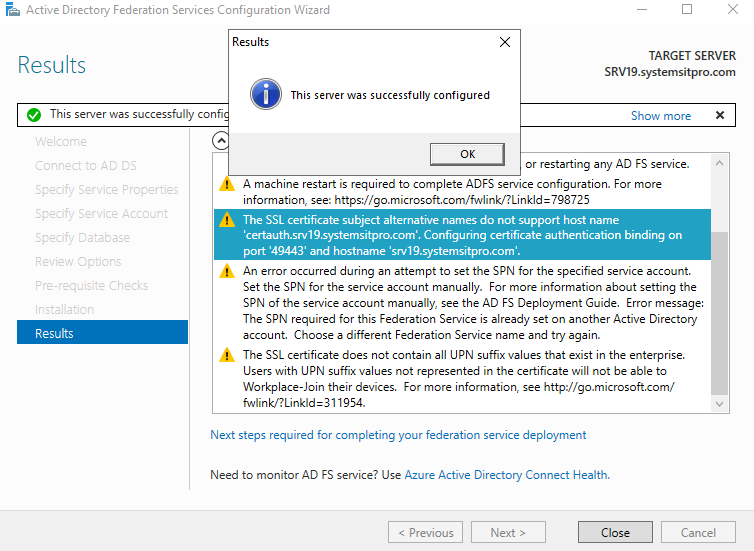 On the Specify Service properties page, Import/Select Certificate, Select Federation Service Name and Specify Federation Service Display Name then Next. On the Specify Service Account page, you can either Create a Group Managed Service Account (gMSA) or Specify an existing Service or gMSA Account. Important: KDS Root Key needs to be set at this step or previous in order to enable AD to operate with gMSA's. One key benefit of gMSA's is auto-negotiated password update feature. After the command is successfully run go back to your ADFS Server and go to the previous page and then Next. Select Create a Group Managed Service Account, enter the preferred name then Next. On the Specify Database page, select Create a Database on this server Using WID and Next. Note: you could also specify a SQL Server, make sure you have a sysadmin or a least dbcreator permissions. For more details see Microsoft https://docs.microsoft.com/en-us/windows-server/identity/ad-fs/deployment/configure-a-federation-server. On the Review Options page, Review and Next. 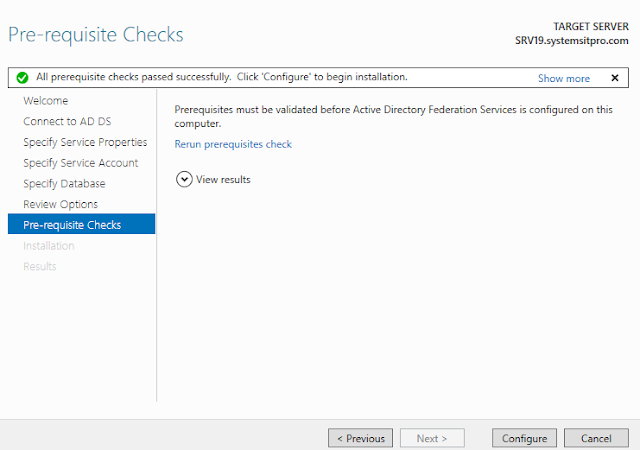 On the Pre-requisite Checks page, review and click Configure. On the Results page, review any warnings and close. 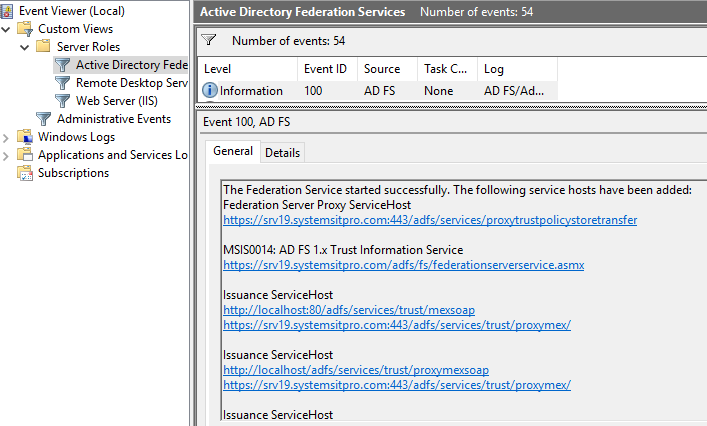 Open the Event Viewer and navigate to the ADFS View and search for the Event ID 100.